This solution was discovered by Albert Einstein and his colleague Nathan Rosen, who first published the result in 1935. 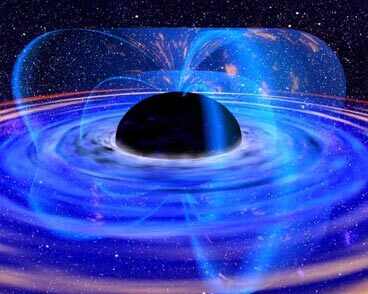 However, in 1962 John A. Wheeler and Robert W. Fuller published a paper showing that this type of wormhole is unstable, and that it will pinch off instantly as soon as it forms, preventing even light from making it through. A pole shift refers to the Earth’s magnetic field reversing its polarity. If a magnetic reversal occurred today, compasses would point south rather than north. In the past 15 million years scientists found pole shifts occurred four times every 1 million years. Though this averages out to once every 250,000 years, switches do not occur at regular intervals. During one period in the Cretaceous, polarity remained constant for as long as 30 million years, though this is believed to be an anomaly. The last pole shift took place 790,000 years ago; causing some scientists to believe we’re due, while others speculate a reversal is already underway. Dynamic processes taking place deep inside the planet generate Earth’s magnetic field. A core of molten iron surrounds the inner core of solid iron, each rotating at different rates. Their interaction, and perhaps other geophysical processes not yet understood, creates what scientists call a “hydromagnetic dynamo.” This self-perpetuating electric field acts in some ways like a gigantic bar magnet. 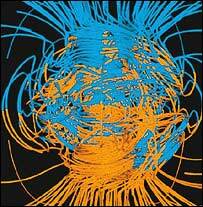 The Earth’s magnetic field extends into space for tens of thousands of miles from the planet’s poles. It not only protects the Earth from solar radiation but plays a fundamental role in overall climate, weather patterns, and migratory habits of animals. If the poles were to reverse instantly, destruction would be global, from earthquakes and volcanic eruptions to melting of Arctic ice and vast flooding. However, evidence suggests pole shifts happen gradually taking anywhere from 1,000 — 28,000 years. The last four flip-flops took about 7,000 years each. Evidence for pole shifts came unexpectedly in the 1950s while exploring seafloor spreading along the mid-Atlantic ridge. Here molten material wells up, cools and hardens, creating new sea crust, pushing the old crust outwards. Magnetic particles or iron oxides in the lava act like tiny compass needles, aligning themselves with the magnetic field, leaving a permanent record of the Earth’s polarity at the time the crust is created. By reading the orientation of the oxides at various distances out from the point of welling, scientists can “look back in time.” What they found was striping or alternating bands — periods of reversal throughout history. Some researchers believe a pole shift is underway today because the magnetic field has decreased in intensity as much as 10% – 15% over the last 150 years, with the rate of decay increasing more significantly in recent years. If this trend continues, the magnetic field will be gone in 1000-2000 years. A weakening magnetic field is a precursor to pole shifts, though it’s acknowledged the current decay might also be attributable to other unknown causes, or might reverse itself. In the case of a pole shift, once the magnetic field weakens enough, the field directions undergo a near-180 degree switch before strengthening and stabilizing in the new orientation. However, scientists don’t really know how long this process takes. What is known is that it takes twice as long at the poles as at the equator. So while compasses at the mid-latitudes might point south after a 3,000-year transition, compasses at the poles would continue to point north for another 3,000 years. The actual mechanisms behind a pole shift are still unknown. Some theories suggest comet impacts might play a role; others, that the magnetic field is inherently prone to flip-flops. Conclusive answers await a better understanding of the dynamics of this very fascinating geophysical phenomenon. Scientists have known for some time that the Earth’s magnetic field is fading. Like a Kryptonite-challenged Superman, its strength has steadily and mysteriously waned, leaving parts of the planet vulnerable to increased radiation from space. Some satellites already feel the effects. What is uncertain is whether the weakened field is on the way to a complete collapse and a reversal that would flip the North and South Poles. Compasses pointing North would then point South. It is not a matter of whether it will happen, but when, said scientists who presented the latest research on the subject at a recent meeting of the American Geophysical Union in San Francisco. But when is hard to pinpoint. The dipole reversal pattern is erratic. “We can have periods without reversals for many millions of years, and we can have four or five reversals within one million years,” said Yves Gallet, from Institut de Physique du Globe de Paris, France, who studies the palaeomagnetic record and estimates that the current decay started 2,000 years ago. Over the last century and a half, since monitoring began, scientists have measured a 10% decline in the dipole. At the current rate of decline it would take 1,500 to 2,000 years to disappear. A particular weakness in the field has been observed off the coast of Brazil in the so-called Southern Atlantic Anomaly. Here, eccentricities in the Earth’s core have caused a “dip” in the field, leaving it 30% weaker than elsewhere. The extra dose of radiation creates electronic glitches in satellites and spacecraft that fly through it. 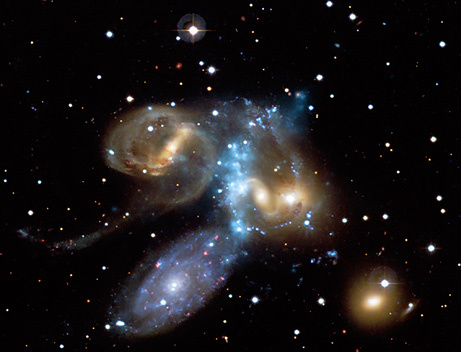 Even the Hubble telescope has been affected. Magnetic reversals were always preceded by weakened magnetic fields, said Dr Gallet, but not all weakened fields bring on a flip-flop. The Earth’s invisible shield could also grow back in strength. 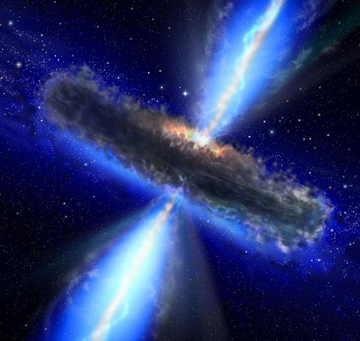 “Then sometime, maybe 10,000 years from now, the dipole will decay again and that will lead to a reversal,” said Harvard physicist Jeremy Bloxham. The theme was recently taken up by Hollywood in the movie The Core, in which the Earth’s core mysteriously stops spinning, effectively turning off the electromagnetic field. The movie is nonsense, scientists told BBC News Online, except that the Earth’s magnetic field is generated by activity deep inside it. The heat of the solid inner core keeps the molten cocktail of nickel and iron churning in the outer core, which generates a magnetic field. It is not known how the core behaves exactly, but scientists have a general understanding of how electrical and fluid currents and magnetic field lines all interact to produce the field we experience outside Earth. Imagine the magnetic field lines within the core “twisting like spaghetti,” said Peter L Olson, geophysics professor at Johns Hopkins University. As they wind and kink around each other, their interaction can accentuate the magnetic field or diminish it. The last time the field lines kinked into a dipole reversal was 780,000 years ago. By studying seafloor sediment and lava flows, scientists can reconstruct the magnetic field patterns of the past. Iron in lava, for example, points in the direction of the then-existing field and is frozen in that orientation as the lava cools and hardens. According to Dr Gallet, the oldest reversal that has been studied by lava flows comes from Greenland, dated at 16 million years. The time between reversals varies from a thousand to millions of years. So is the Earth about to flip? The safe bet may disappoint screenplay writers everywhere. And they would certainly not threaten life on Earth as they do in science fiction. 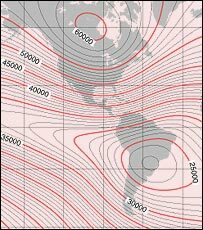 Although there would be extra radiation exposure to satellites and some airplanes, there would also be enough of a residual field to provide protection to people, and certainly no more radiation than what is observed at the poles, where the field lines currently dip. But there would be some bizarre readjustment. Prior to Earth’s poles re-establishing themselves, a period of disorder would produce multiple poles, according to Dr Bloxham, which may make backwoods camping tricky. “Getting around using a magnetic compass would be a more complicated endeavour,” he said. A collapse would also produce a great increase in auroral activity – the beautiful display of lights generated by solar particles that follow the magnetic field lines down into the atmosphere. And there would be plenty to time to grab a camera – the reversal is gradual. This would give animals which use the magnetic field for navigation, such as some birds, turtles and bees, time to reorient themselves. As for the ozone layer – which was thought to be vulnerable without a protective shield – the effects would be negligible unless there was a super-solar proton event, said Charles H Jackman, an atmospheric physicist at the US space agency’s Goddard Flight Center, referring to the high-energy radiation that can accompany solar flares. The charged particles zinging down to Earth, said Dr Jackman, break apart molecules of nitrogen, whose atoms go on to form nitric oxide, which devours up ozone. This happens all the time, but the effects would be increased during a magnetic reversal or diminished magnetic field. But he said scientists saw no significant change in ozone depletion due to the Southern Atlantic Anomaly. In any case, the ozone layer would bounce back quickly from the heavy solar bombardment, healing itself in just two to three years, according to Dr Jackman. This is not the timeline associated with anthropogenic chlorofluorocarbons. “Chlorofluorocarbons have a much longer lifetime in the atmosphere than does the nitric oxide and its associated constituents,” he said. But all these scenarios are of an indeterminate future. The Earth’s interior will remain unexplored for a long time to come – only in science fiction can humans or their equipment survive the 5,500 Celsius temperature in the core to study its activity.